When researching or writing about courage, other traits fall into the mix: risk, vulnerability, curiosity, empathy, and action. It seems, then, that courage has nothing to do with your title or level of expertise. It’s not for the few or the gifted. It’s an act of humanity, of choosing to take an action that is risky because it demands vulnerability and curiosity. Courage has no specific form and knows no bounds. From starting a side project to the act of listening when you would rather interject, every day we are wrapped in opportunities to exercise courage. We need your courage. It’s going to be risky and will require vulnerability. A posture of empathy and curiosity will empower you. And above all, you must take action. 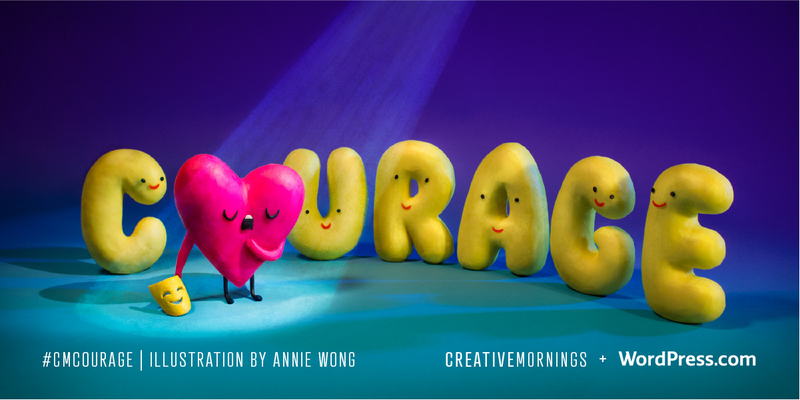 This month is presented by our global partner WordPress.com This month’s global exploration of Courage was chosen by our Oakland chapter and illustrated by Annie Wong aka Headexplodie.